Images of abortion victims recently unearthed in what appears to be a presentation connected to the largest professional association of abortion providers prove the humanity of the preborn child. 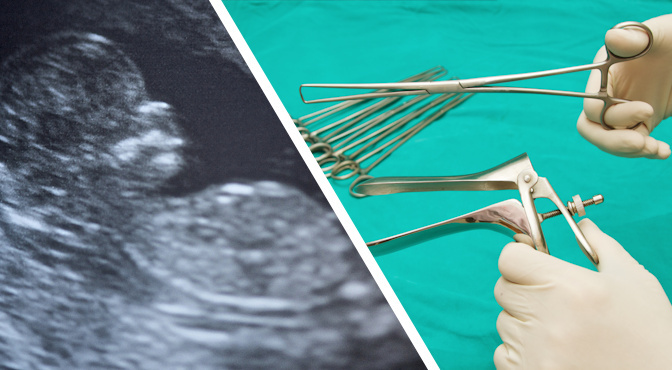 While the abortion industry tells women that their preborn children are mere ‘clumps of cells,’ the images below reveal that they’ve always known the truth: preborn children, even in the first trimester, are recognizable as human beings. Warning: The images below may be disturbing. The 2009 slide presentation, “The Basics of First-Trimester Surgical Abortion Workshop,” is clearly marked “National Abortion Federation” (NAF) and indicates that it was either created by NAF or created for a NAF event. Float the specimen in water. The majority of abortions are committed before the fourteenth week of pregnancy but women are not always given accurate information about fetal development at that stage, especially early in pregnancy. The Centers for Disease Control (CDC) states that the majority abortions are committed at or less than the thirteenth week of pregnancy. According to the 62-page presentation, fetal remains after a first trimester abortion would be visible as follows. Nine weeks: “Fragmented or intact fetal parts, including elbows and knees, digits no longer webbed.” The slide (image below) appears to show extremities, such as part of an arm and hand. NAF Slide first trimester abortion 2. Visible are a ribcage, arms, and legs. NAF Slide first trimester abortion 3. Visible are arms and hands. NAF Slide first trimester abortion. Visible are arms and hands. Despite numerous denials that pro-life images are authentic pictures of aborted preborn children, these images, published by abortion insiders, are markedly similar to those published by Citizens for a Pro-life Society, Created Equal, Center for Bio-ethical Reform (CBR), and others, including some published by Live Action News. Despite the marketing deception from the abortion industry, they are clear and undeniable evidence that what is being “aborted” are not merely “products of conception” but tiny beautifully formed human beings deserving of protection. Abortion profiteers often tell women that the preborn child is not identifiable — and in some cases, after being removed and torn apart by high-powered suction, that may be true, but only AFTER the abortion. Below is a picture of Baby Riley, who was miscarried at seven-and-a-half weeks. Of course, any child aborted at this stage of pregnancy, when their tiny soft tissue is pulled apart by a high powered suction machine will most likely appear unidentifiable. The truth is that, prior to that, a fetal heartbeat can be detected as early as five to six weeks gestation (3-4 weeks post-fertilization). Stunning images of fetal development at the earliest stages of life have been published at Live Action News, which you can view here. Live Action News recently reported about how the FDA is contracting with Advanced Bioscience Resources (ABR) to obtain “fresh human tissues” — aborted fetal body parts — “for implantation into severely immune-compromised mice to create chimeric animals that have a human immune system.” ABR’s history with fetal tissue research goes back years. According to the Center for Medical Progress, ABR is “the largest and oldest fetal tissue seller in the U.S.” It was founded in 1989, and is the primary supplier of fetal tissue for the U.S. government. And it has paid numerous abortion facilities a great deal of money for this tissue — including a number of Planned Parenthood centers. The Food and Drug Administration has also paid about $73,000 to the company since 2009… mostly for liver and thymus tissue that are used largely to develop a human-like immune system in mice…. The NIH, with a $30 billion budget for research nationwide, funded about $76 million in dozens of fetal tissue projects in 2014. The FDA has a dozen contracts with ABR for various items, including lab equipment and supplies, according to the General Services Administration’s Federal Procurement Data System. Online records at the National Institutes of Health (NIH) indicate ABR is regularly granted federal dollars for various projects. 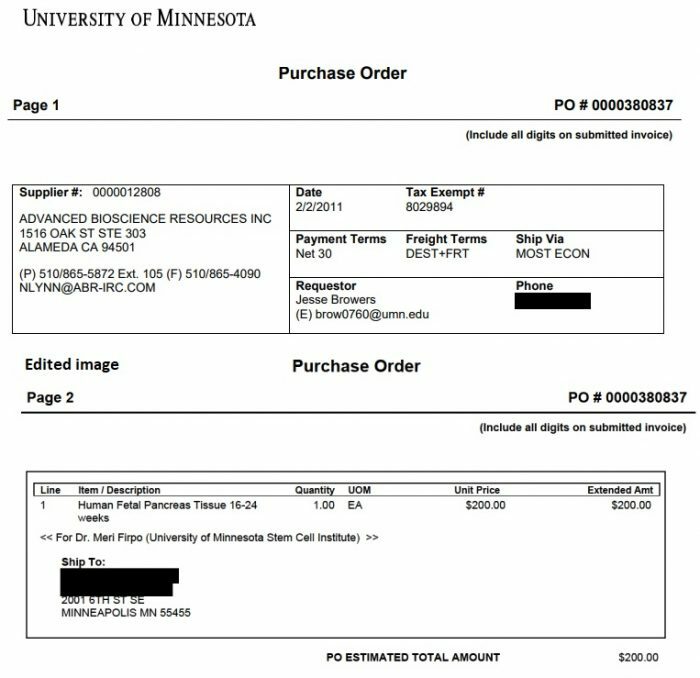 The University of Minnesota (UM)… obtains fetal tissue from procurement companies—in this case, Advanced Bioscience Resources (ABR) and StemExpress—in addition to an area clinic. The University of Wisconsin, School of Medicine and Public Health (UW SMPH)… more recently obtained fetal tissue for research from the Albert Einstein College of Medicine, UW, and ABR. Colorado State University (CSU)… receives a significant amount in federal grants and obtains much of its fetal tissue from ABR and StemExpress. Between 2010 and 2015, CSU received seven NIH grants to support their projects using fetal tissue, at a taxpayer expense of $3.5 million. 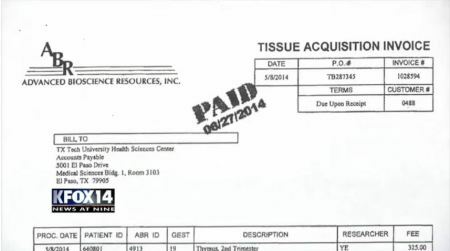 In 2016, Houston attorney Briscoe Cain claimed he found evidence of four Texas medical schools purchasing fetal tissue from ABR. 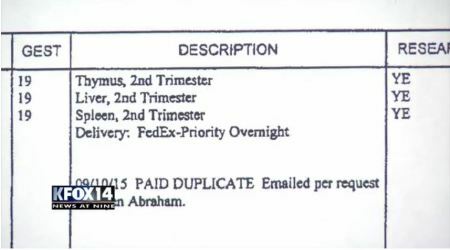 Invoices from to one of the schools, given to KFOX14 Investigates and reported by CBS4, show the school paid at least $4,000-$5,000 for fetal parts including livers, spleens and thymuses. “The research being done is humanized mice. Scientists inject the mouse with fetal tissue so the mouse is genetically altered to accept the graphing of human tissue,” Cain said at the time. In 2011, the University of Minnesota contracted with ABR for “human fetal pancreas tissue” between 16-24 weeks. In 2000, the Government Accountability Office (GAO) was tasked to study “the involvement of federal agencies under the jurisdiction of the Senate Committee on Appropriations, Subcommittee on Labor, Health and Human Services, and Education in the acquisition of human fetal tissue for biomedical research.” The Department of Health and Human Services (HHS) told GAO that “NIH is the only federal agency under the Labor, HHS, and Education Subcommittee’s jurisdiction that sponsors research using human fetal tissue.” But Live Action previously showed that the EPA used aborted fetal tissue for research in the 1970’s. The Birth Defects Laboratory at the University of Washington, which distributed 2,869 human fetal tissue samples and collected $52,035 in fees directly from researchers in fiscal year 1999. The Brain and Tissue Banks for Developmental Disorders at the University of Maryland and the University of Miami School of Medicine/Children’s Hospital of Orange County, primarily to serve as suppliers of human nonfetal tissue…. The University of Maryland Bank provided 195 human fetal tissue samples to investigators in fiscal year 1999, and the University of Miami Bank provided approximately 40 samples between March 1 and August 31, 1999. GAO states that researchers also obtained human fetal tissue from private organizations that did not directly receive federal funds, including ABR. Tuesday, the California Attorney General’s office of Kamala Harris, who was elected with tens of thousands of dollars from taxpayer-funded Planned Parenthood, seized all video footage showing Planned Parenthood’s criminal trade in aborted baby parts, in addition to my personal information. Ironically, while seizing my First Amendment work product, they ignored documents showing the illicit scheme between StemExpress and Planned Parenthood. 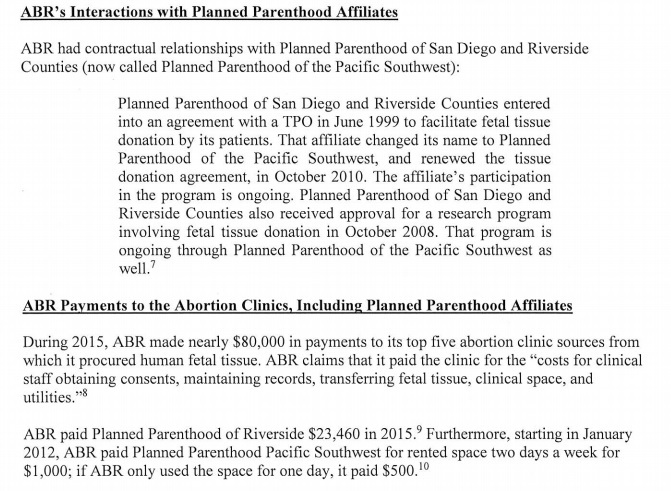 This is no surprise–Planned Parenthood’s bought-and-paid-for AG has steadfastly refused to enforce the law against the baby body parts traffickers in our state, or even investigate them–while at the same time doing their bidding to harass and intimidate citizen journalists. We will pursue all remedies to vindicate our First Amendment rights. Three new subpoenas come to New Mexico focused on individuals at the University of New Mexico (UNM) and Southwestern Women’s Options. The subpoenas ask for information such as: studies, research or experiments that individuals have participated in, the number and type of fetal tissue obtained from Southwestern Women’s Options, personnel that procured tissue from SWO and documents proving benefits or compensation for providing fetal tissue. UNM as a publicly funded institution bears the responsibility of transparency, yet, at every turn they avoid accountability and fight to keep the truth from being exposed about how deeply entrenched their radical abortion agenda is. Whether through our and other pro-life attempts to obtain public records or congressional attempts, UNM just doubles down and is petrified about the consequences of allowing even basic facts about their abortion involvement from seeing the light of day. Some claim that aborted fetal tissue harvesting is necessary to make strides in medical research and defend the use of aborted fetal cells in vaccines. We maintain the position that utilizing and capitalizing on the death and body parts of innocent children for any reason is immoral and unethical and should therefore cease immediately. To read a related press release, click here.